Leading Manufacturer of reclosable bags from Mumbai. We are recognized in the industry for offering a quality assured range of Reclosable Bags. Easy to close & open, these reclosable bags are manufactured using best quality material & advanced machines in compliance with set standards of market. 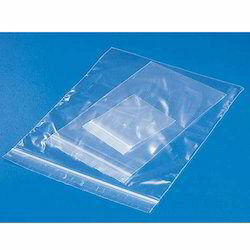 Also, we provide these reclosable bags in various customized options as per client-specific requirements. our reclosable bags are checked in terms of quality by our quality experts in order to deliver flawless range from our side.